The Battle of Hoth begins. 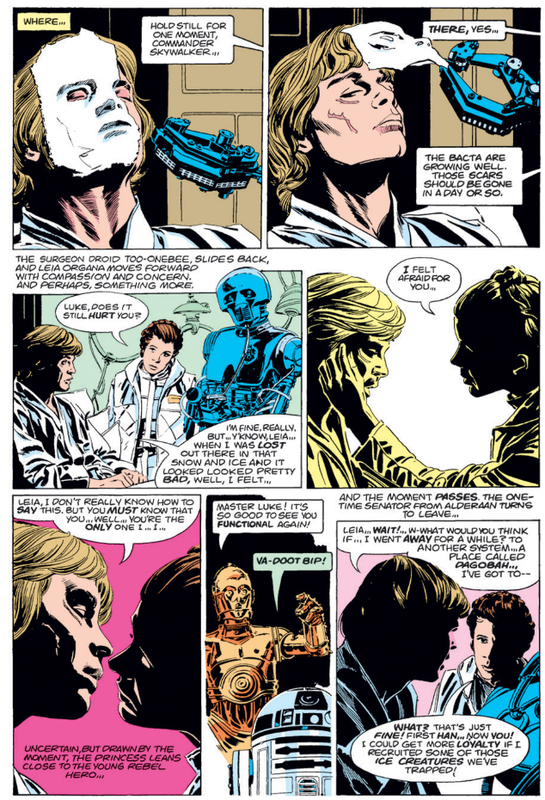 With the Rebel base on high alert, a recovering Luke tries to tell Leia how he feels about her before thanking Han for saving his life. Meanwhile, Darth Vader executes Admiral Ozzel for emerging from hyperspace too close to the planet, alerting the Rebels of their imminent attack. On Hoth, Leia briefs the Rebels on their escape plan as Han and Chewie scramble to get the Falcon ready to fly. 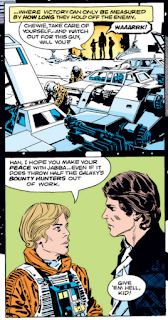 Luke bids them goodbye, then climbs into his Snowspeeder to help the defense of the base against the Imperial forces and their massive walkers. 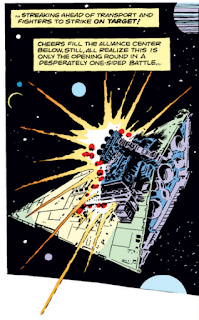 With their armor shielded against the vehicles' blasters, the Rebels are forced to use tow cables to bring down the Imperial walkers, but Luke is shot down as he moves into position for another attack, his ship crashing right into the path of an oncoming walker. 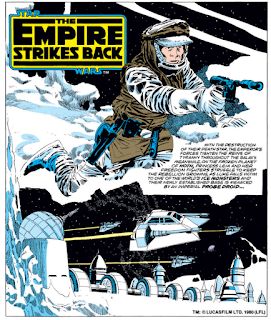 Mentioned last issue, both Admiral Ozzel and General Veers appear for the first time in this issue, though the former is quickly slain by Vader for coming out of hyperspace too close to Hoth, thus alerting the Rebels to their arrival, after which Captain Piett is promoted to Admiral in his place. Also appearing in this issue is Toryn Farr, the woman manning the com station at Echo Base as the first transports evacuate the base. She represents the only other woman besides Leia to appear in Empire, and is one of only four women (including Leia) with dialogue in the entire original trilogy (unless you count Oola's grunts and shrieks of terror in Return of the Jedi as dialogue, in which case she's one of five). 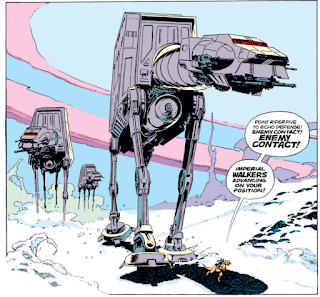 This issue gives us our first look at the Imperial All-Terrain Armored Transports aka AT-ATs or, more commonly, walkers, the massive, elephantine ground attack craft of the Empire. As with the previous issue, this opens with a scene-setting splash page before the principle action begins. Another cover marred by an ugly yellow banner along the top, this one extolling the readers' chances of winning a Toys "R" Us shopping spree. Rick Veitch (whose brother Tom later wrote the Dark Empire and Tales of the Jedi series for Dark Horse in the early 90s) wrote about his experience lettering (and doing some background art) for this story, as well as working with Al Williamson, which can be found here. 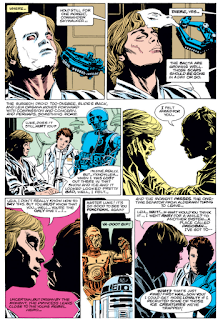 When Luke bids goodbye to Han in this issue, it represents the last time the two characters will directly interact with one another until the events of Return of the Jedi. 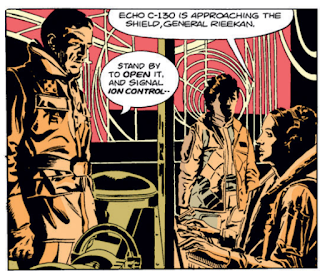 This issue establishes that the Rebels have herded a group of wampas (called just "ice creatures" in the issue) into a sealed room in the base. The aftermath of Luke's wampa attack shows him receiving some kind of facial bandage to help heal the cut on his face, while the dialogue between him and Leia before Han and Chewie enter the room is different than in the film (it mostly matches the deleted scene from the Blu-ray). The ion cannon blast depicted here is physically more disruptive than in the film; ion cannons are meant to disable a ship's shields and electronic systems, not hit with any physical force (they're basically like directed EMP blasts). Unlike in the film, a Rebel scout aboard a tauntaun makes first contact with the Imperial walkers. 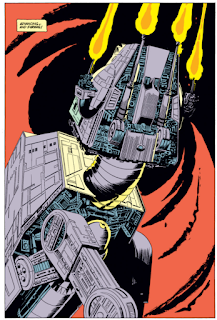 There's a really swell full page splash of an Imperial Walker. Like, "I'd like to hang that on my wall" good. You Kiss Your Sister With That Mouth? 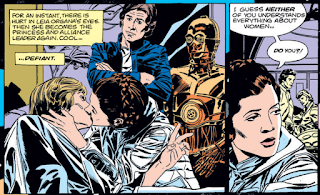 The most significant (since it appeared in a movie) Luke/Leia kiss appears in this issue, as she plants one on Luke, ostensibly to make Han jealous. 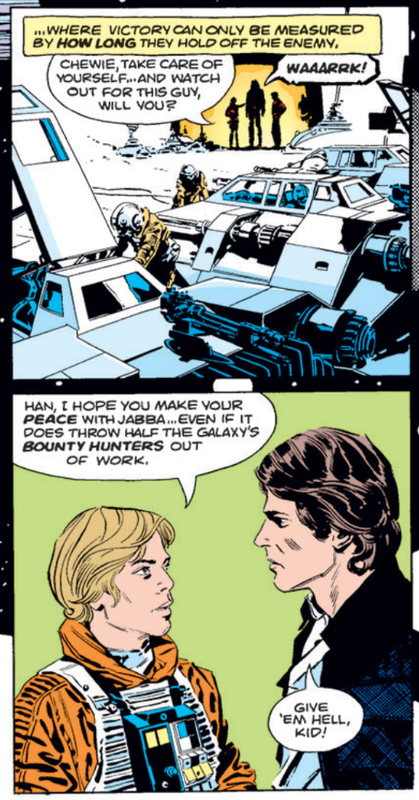 A letter in this issue praises the creative team for finally getting Luke out of his Tatooine whites. 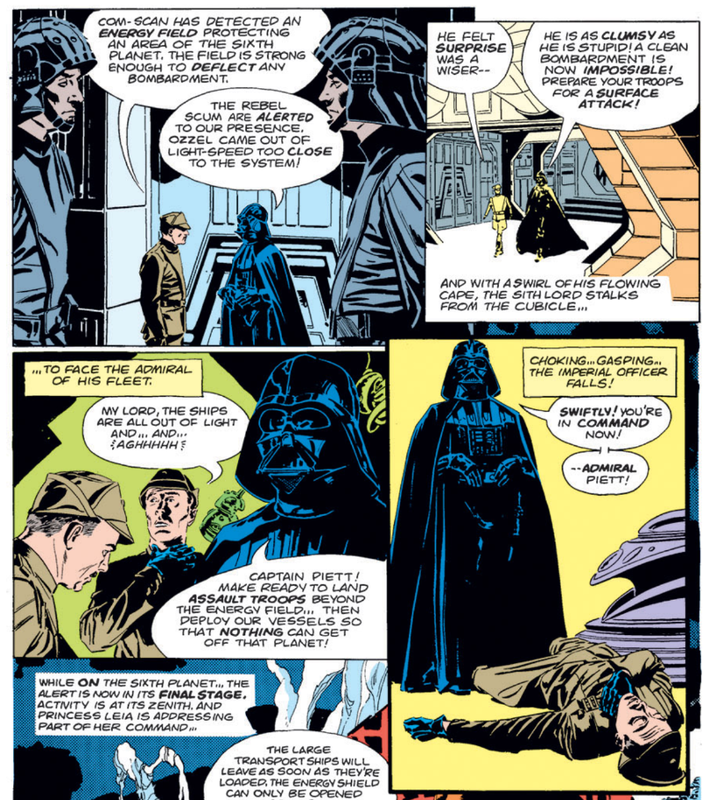 The response attempts to sell the idea that he remained in that attire as a way of blending in (which seems suspect since no one else on any other world was ever wearing anything close to it), while also admitting it had much to do with presenting an image of Luke each month that was most likely to be familiar to anyone picking up an issue for the first time (whether that was a LucasFilm edict or something Marvel decided on their own isn't said). In reviewing the series' initial adaptation of the first film, I wrote about the way it broke up the narrative to suit the "end each chapter on a cliffhanger" approach of comic book storytelling, an easier task given the film's roots in old timey movie serials. This issue of the Empire adaptation is another interesting case study. 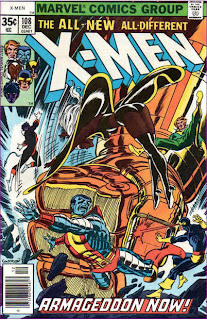 Having only read this story in collected format (without noting where each individual issue would have ended and the next began) I don't recall exactly where in the story each issue breaks. 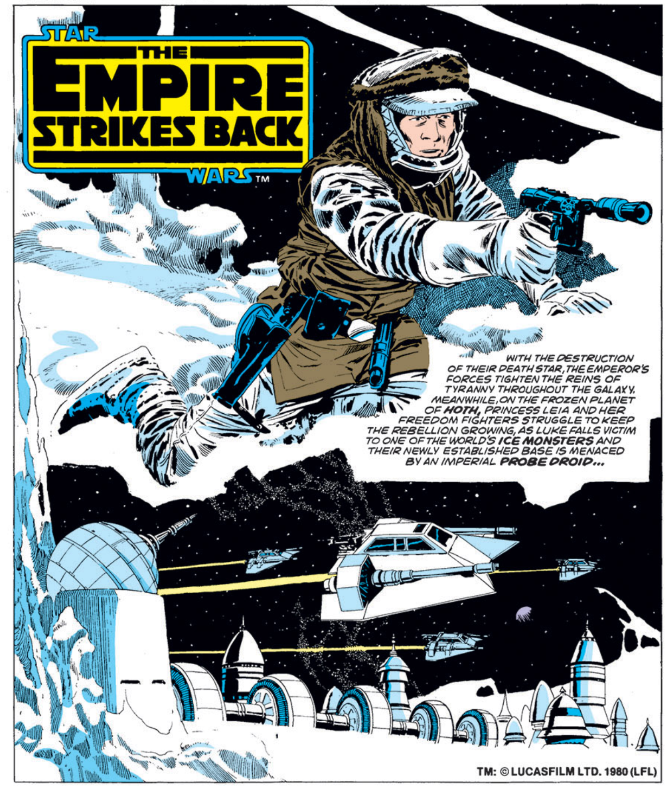 Given the cover and pacing of the narrative, I'd assumed this issue would cover the entirety of the Battle of the Hoth, ending right around the time the Millennium Falcon blasts away from Vader, effectively ending the first act. 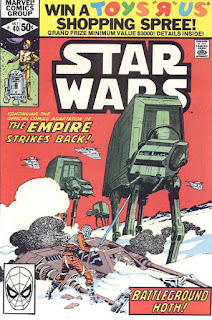 Of course, that's not the most compelling of endings for an issue - the heroes escaping safely - so instead Goodwin & company spread the Battle of Hoth across two issues, taking a break just as Luke's snowspeeder crashes and is threatened by an oncoming walker. 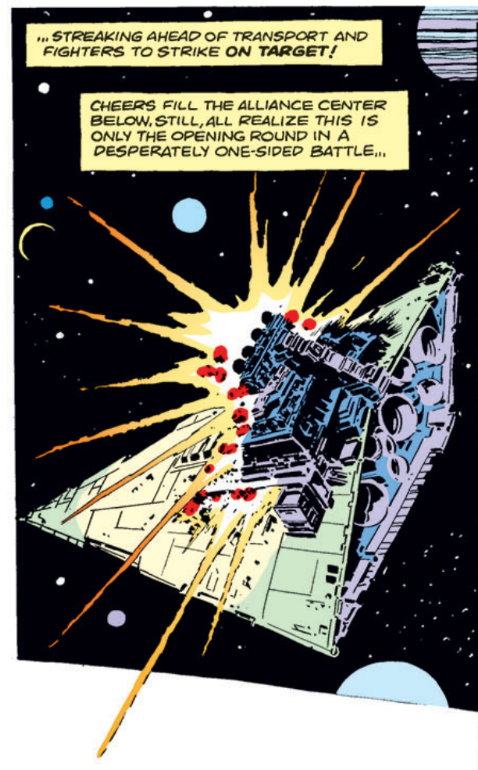 It's a relatively minor moment of suspense in the film (the tension builds nicely as Luke tries to get the unconscious Dak out of the vehicle before the walker crushes it, but I doubt anyone was genuinely fearing for Luke's life that early in the movie), but is the perfect kind of thing on which to end a comic book issue, leaving the reader a month to speculate (theoretically, at least; most readers had probably seen the movie by now) not whether Luke would survive, but how, while allowing the opening of the next issue to begin with a heroic triumph. Out of the frying pan, into the fire on Hoth. Here’s a thought I’ve somehow never had before, which may well have been covered in Expanded Universe tales: Where does the Rebel Alliance get the finances, talent, and space to build its ships? I can see there being enough sympathy throughout the Empire to provide the first two, and it’s a big galaxy, but it’s apparently not so big a galaxy that the Alliance has more than one main base that the Empire will find roughly once per movie. The hangar on Hoth doesn’t come across to me as big enough to house all the ships that must be there, let alone to accommodate the work areas for building more. Were there much larger compounds on Hoth and, lo, the moons of Yavin than it seems from our limited glimpses in the films? Yeah. I actually like the panel you show above that even more. Very nice job by Veitch, mostly, drawing the Walkers. Plus more stellar (no pun intended) coloring by Glynis throughout. 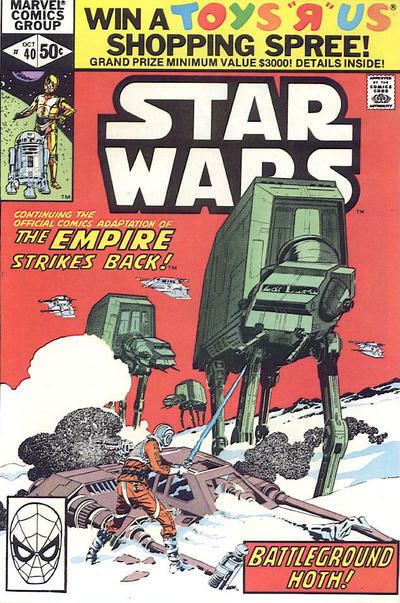 I bought these issues off the racks but haven’t read them in ages, so the fact that we’ll be on Hoth into the third issue really surprised me. Excellent point about how the chapter breaks are optimized for serial comics. The EU did indeed spend some time establishing how the Rebel Alliance worked (though not as much as you might think), with the new canon actually focusing on it quite a bit as well now via REBELS (and, soon, at least in part, ROGUE ONE). The basic idea (which is still canonical), is that the Rebel Alliance is so called because it's an alliance of a bunch of different rebel cells from different parts of the galaxy, attempting to attack the Empire in a coordinated effort. It's actually a rather new development, with the acquisition of the Death Star plans and subsequent destruction of the Death Star one of the first major efforts (and victories) of the combined Alliance - prior to that, most cells kinda did their own thing, worried that banding together would just give the Empire a larger target to hit, thus risking taking out all opposition at once. In the old EU, the Alliance came together chiefly when three larger cells, each led, respectively, by Mon Mothma, Bail Organa, and an EU-only Corellian Garm Bel Iblis, came together and signed a treaty that formed the larger group (Bel Iblis shortly thereafter split off on his own due to differences w/Mon Mothma, to explain his absence from the films in that decidedly EU-manner). I'm not sure how much of that remains canon, but REBELS has featured Bail Organa as the leader of a larger rebel cell (into which the heroes of the show eventually get integrated). In terms of ships, money, material, etc., most of it gets cobbled together from people, companies, systems, etc. sympathetic to the Rebellion. X-wings are made by Incom, and the Rebellion mostly buys them from that company, which is sympathetic (whereas the Sienar Fleet Systems and Kuat Drive Yards that manufacture Imperial ships are firmly in the Empire's pocket). The bulk of their capital ships, as seen in JEDI, are Mon Calamari in design, because when the Mon Cal's rebelled and joined the Alliance, they brought as many of their ships (which they made) with them as they could (at least according to the EU), and in the post-Jedi EU, the Rebellion-turned-New Republic used a lot of captured/turned over Star Destroyers. But the canon gets a little iffy there too; a REBELS episode recently suggested that the B-wing's design (and a prototype) was acquired by one of the show's characters (and then presumably manufactured by the Rebellion), whereas previously we were led to believe it was just a new ship design created by another Rebel-sympathetic company. In terms of bases, Yavin represents the bulk of the (still newly-formed) Alliance's fighters, though obviously we didn't see much of their capital ships at that time. 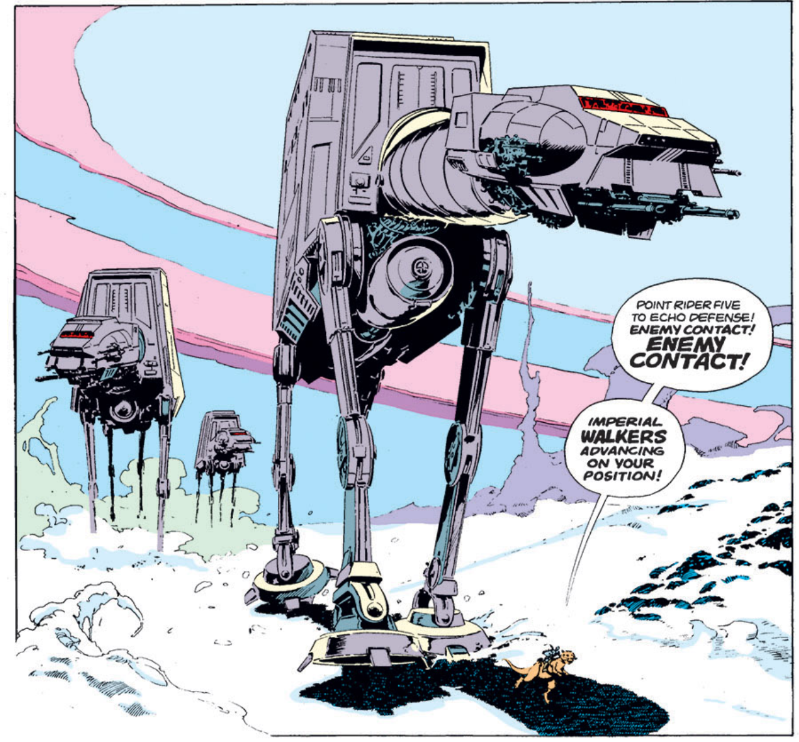 I think Hoth at the time of EMPIRE was still a work in progress, and thus didn't represent the entirety of their resources (hence the rest of the fleet with which Luke, Leia, etc. rendezvous at the end of the movie). The gathering at Sullust which occurs in JEDI is meant to represent the vast majority of Rebel ships at that time; their assault on the second Death Star in that movie was a Hail Mary as much because they were committing all their ship-related resources to one battle for the first time (thus if they lose, it pretty much means the end of the Rebellion as it existed at that time) as anything else. 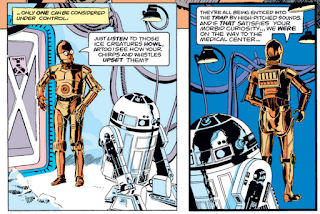 "When Luke bids goodbye to Han in this issue, it represents the last time the two characters will directly interact with one another until the events of Return of the Jedi." Wow. I've seen these movies a hundred times but somehow never really registered that. In fact, even up to this point, Luke and Han barely have any scenes together in EMPIRE! It's what, maybe three total? 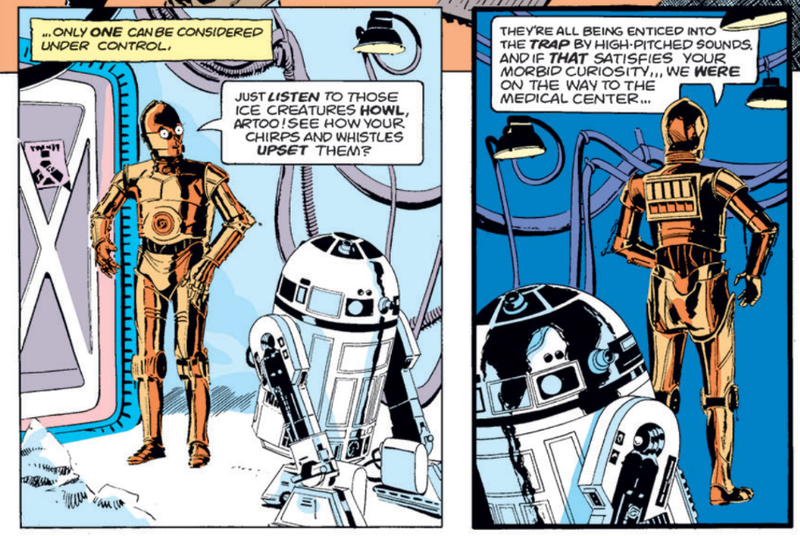 (And that includes the bit in the snow where Luke is delirious and they don't really speak!) Crazy. Also, Williamson appears to have mixed up Ozzel and Piett here? It looks like Vader chokes out the clean-shaven officer and then puts the mustachioed one in command. So the third and fourth speaking females in the trilogy are Mon Mothma and the lady pilot in JEDI, right? Hey, if Camie hadn't been cut from the first film, there'd be a whopping five! 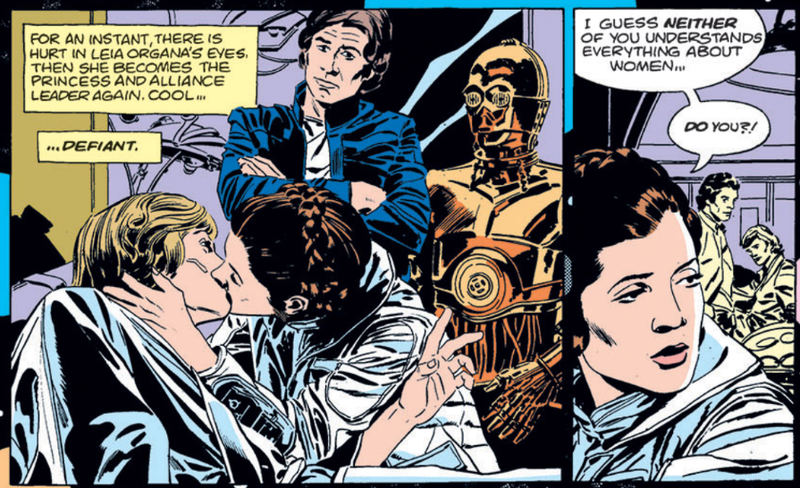 STAR WARS must be the most universally beloved franchise ever to utterly fail the Bechdel test. Mon Mothma and Aunt Beru are the other two speaking females (not counting Oola in JEDI). The lady pilot in JEDI, while played by a woman, was dubbed over by a man in the film, so she doesn't count as a speaking female.